It doesn't wrap around your wrist (that's what the Galaxy Gear is for), but Samsung's next Galaxy phone might feature a wraparound display that extends the screen past its bezels onto the sides of the device. With a three-sided display, the new Galaxy phone would be able to display messages, stocks and other information on its sides. The wraparound Galaxy phone is said to use an upgraded version of the Youm flexible display tech seen in the Galaxy Round phone unveiled last month. According to Bloomberg, which learned about this new Galaxy phone from numerous unnamed sources, the three-sided display tech could be used in a Note or S phone, or could be used to start a new line of Galaxy devices. Samsung revealed the curved Galaxy Round just last month, but with Apple reportedly working on its own curved iPhones Samsung may be feeling pressure to continue to innovate. Bloomberg's sources said there's no exact release date for the new Galaxy device, though the tri-sided phone could arrive during the second half of 2014. 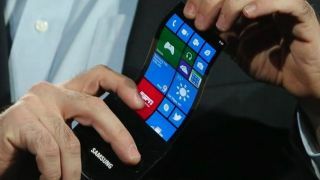 Samsung showed off the Youm flexible display tech at CES this year, but it's yet to be used on a widely released commercial product. With the Galaxy Round out in the open and reports like this one coming in, it seems that will soon change. Not to mention that LG has confirmed that it has its own flexible displays in the works, and both companies are reportedly working hard on developing flexible batteries. Here's everything we know about the Samsung Galaxy Round, the first smartphone with a curved display!